That's right! Almost slipped past you, didn't it? Not to forget! September is the month in which we all plant banana trees. September and banana trees are practically synonymous, and considering the banana's many subtle varieties, let us deliberate wisley on which banana(s) to plant this month. I found a wonderful resource today, in the Maas Nursery newsletter. I have decided on the Ice Cream (Blue Java) tree because its leaves are an enchanted silvery green, with delicate blue fruit that tastes like fresh Mexican flan. 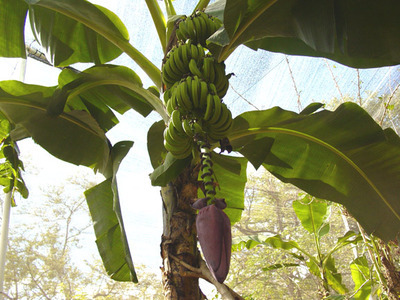 If you live on the east coast, midwest, north, northeast, or northwest part of the country, remember, all it takes is growing your banana tree in a grow bag/burlap sack so that you can alternate between indoor and outdoor growing on a seasonal rotation! Inside fall and winter and outside in the summer! !